Local farmers from Gihanga commune in Bubanza province received cows as part of a program involved in the fight against hunger. However, they die one after the other due to unknown diseases. Beneficiaries are worried. The provincial official in charge of breeding reassures. Some of the local farmers are disillusioned with the situation. They wonder whether the cows distributed last December were not already sick. Some of the infected cows release too soft dung while others release urine streaked with blood. The temperature is very high. They hardly eat and drink water. Veterinarians talk about theleriosis and babesiosis diseases. About 72 animals were distributed by the National Program for Food Security and Rural Development of the Imbo and Moso Plains, PNSADRIM. Among them, 14 have already died in less than a month. The beneficiaries say there is a lot of loss. Marie Ganza, from Village V in Gihanga commune, says that her cow died in a strange way. It was very weak; it could not feed itself anymore. “The temperature rose to 42 ° C despite the intervention of veterinarians. There was blood in its urine,” she says adding that its health was not improving. “We had to kill it two weeks after we had received it,” he says. Jean-Marie Congera, another beneficiary of Village V, says his cow has never eaten grass since it was received on 15 December. “Its temperature rose between 40 and 42 ° C,” he says. This farmer says he has used different drugs to save his domestic animal in vain. He says after two days the temperature came down to 38 ° C. The great hopes we had raised didn’t last long: “I found it lying in its stable in the morning. It was already dead,” he angrily says. According to him, his cow was buried, but it was dug up by unknown people, the next day. “Maybe they ate it despite the administrative ban, I do not know,” he explains. When some breeders resignedly welcomed the death of their cows, this is not the case for Balthazar Hatungimana. He is inconsolable. He was evacuated to hospital after feeling unwell. He remained bedridden for a whole week. “When I heard about the death of my cow, I fell down. This cow was really part of my family”, he says it with tears. The beneficiaries of these cows claim compensation. “We also want a modern breeding,” says Hatungimana. Ferdinand Ntiharirizwa, one of the beneficiaries of Village V, says his cow is in agony. “My cow just spent almost a month releasing urine streaked with blood. The community worker did everything but nothing changed, “he angrily says. He also mentions that his cow is already infected: «It can hardly stand and drink water,” he says adding that his cow should pass away at any moment. Apolline Ndayishimiye, another beneficiary of village 3, says her cow also begins to show signs that do not reassure: “Its hair is straightened”. She also says many cows are already dead: “Veterinarians do everything but to no avail. Mine will also die soon “. Mrs. Ndayishimiye calls on the authorities to deploy veterinarians and other technicians to rescue those that have not been infected yet. “Not only is it expensive to feed these cows, but also their medications are really expensive,” she complaints. Jean-Claude Nduwimana, a Community Animal Health Officer (Acsa) from Village V in Gihanga commune, says these cows suffer from theleriosis because they have several ticks. “Since it was not the first time we had cows suffering from this disease, we thought the situation would improve,” he says. As for him, these cows would have come from a very cold environment. “So, it becomes very difficult for them to adapt to a warm environment like ours,” he says. After several visits, Mr. Nduwimana was able to notice that these cows had just spent several days without medical supervision. “I change drugs and injections to try to save these animals but to no avail,” he adds. Among 23 cows distributed in Village V, 6 have already died. Léopold Ndayisaba, administrator of Gihanga commune, says there is a big loss. “These 70 cows were distributed as a bonus. The cows given in the first round were well treated,» he says. Out of 13 cows distributed in Gihanga commune in October 2016, only one died. He calls on the Ministry of Livestock to compensate them. “We want to practice improved cow breeding and give up those that are still grazing outside,” he says. Donatien Nkurunziza, the provincial livestock manager, says the 14 cows died after a long journey before reaching their destination. “They were tired and stressed,” he justifies. These cows came from Uganda. As soon as they arrived, they showed signs of babesiosis, verminosis and had several ticks and that was the major cause of theleriosis. Nkurunziza says the office of the Director General of Livestock is informed. It has already deployed a team of laboratory technicians who took some samples “We are waiting for the results”. The officer says the losing beneficiaries will be compensated. According to the distribution agreements, the supplier must replace any dead cow within 10 days after the distribution. 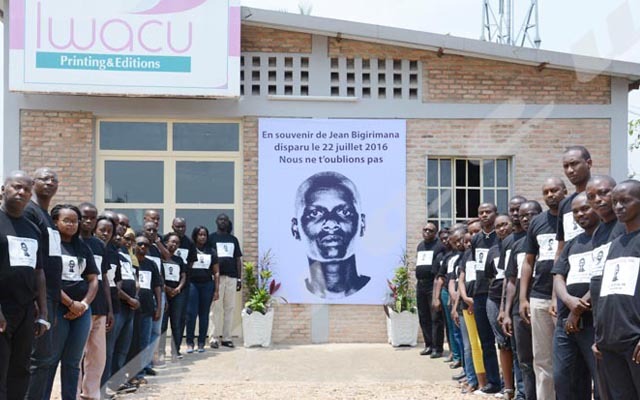 “After 10 days, the loser will wait for the chain of solidarity to be compensated.” He, however, says the ministry calls on the breeders to make a rigorous follow-up of their cows: “They are very fragile and require a very special follow-up”.